Everest Base Camp Dispatch: October 6, 2015 – Sellers are back at Pangboche! 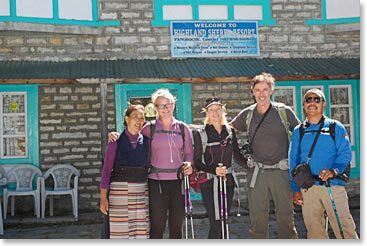 October 6, 2015 – Sellers are back at Pangboche! 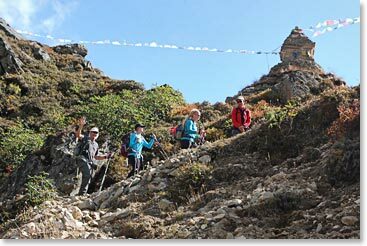 We are now in Pangboche at 13,100ft; great hike from Phortse to here. Weather remains fantastic, clear blue skies. 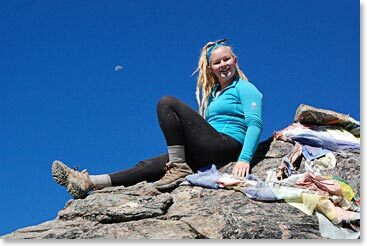 Amazing views of Everest, Lhotse, Nuptse and Ama Dablam. Everyone is happy to see my wife Yangzing again. The Sellers were here with us two years ago. We are all doing great and really lucky with the weather. Hopefully it remains the same since we are planning to fly out on helicopter from here on October 8th. We might visit Ama Dablam Base Camp tomorrow; Berg Adventures is on its final preparation for their climbing expedition starting in the next couple of weeks so we have a busy season here! 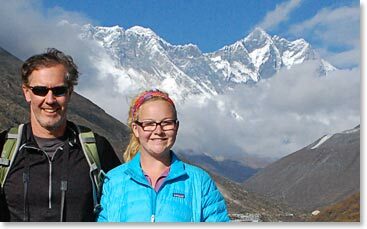 The Sellers last visit at Pangboche, Fall 2013.